NASA is working on a new aircraft wing surface capable of changing shape during flight, which would lead to quieter and more fuel efficient flights. Essentially, NASA scientists are replacing a plane’s traditional aluminum flaps with “shape-changing assemblies” capable of forming bendable and twistable surfaces. 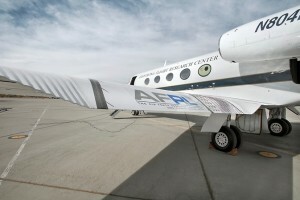 The new aircraft wing technology utilizes aircraft flaps designed by Michigan-based FlexSys called ‘FlexFoil’. FlexFoil is a “variable geometry airfoil,” which can easily be fitted onto existing and new aircraft frames. Currently, NASA is testing the revolutionary technology at NASA’s Armstrong Flight Research Center in Edwards, California using a modified Gulfstream III aircraft.